By his death in 2012, Eric Hobsbawm had become something of a national treasure in Britain. If never a “pop” or TV historian, his work and in particular his Age of . . . series made him known to millions of students and lay readers. Britain’s leading Marxist historian is however easily depoliticized. His late efforts to emphasize the German thinker’s present relevance tended to stress his role as a theorist of capitalist globalization, more than his attachment to the communist project. Indeed, while Hobsbawm wrote pioneering works on the history of social revolt, focused on shoemakers or bandits, he was not a historian of communism itself. These studies were themselves political: they were tied to the British Communist Party Historians’ Group’s effort to rediscover a national tradition of rebellion. But Hobsbawm was not for the Communist Party of Great Britain (CPGB) what Paolo Spriano was for the Italian Communist Party (PCI) — a Communist intellectual who wrote a scholarly history of his own party. It is thus worth asking why Hobsbawm stayed in the CPGB, hardly a mass party, until its demise in 1991. It is commonplace to see 1956 as the real moment of choice: that year, Nikita Khrushchev’s denunciation of Stalin and then the Soviet invasion of Hungary rocked the world Communist movement, in a moral setback which led most of Hobsbawm’s colleagues to break with the CPGB. In this narrative, Hobsbawm is often presented as remaining in party ranks out of residual loyalty, particular to a Jewish man who had escaped Nazi Germany and lived through the golden age of Communist antifascism. Yet as well as being a CPGB man Hobsbawm also declared himself a “spiritual member” of Italy’s PCI. Through personal ties, conferences, and his writing, he built a relationship with the West’s largest Communist party, a force that emerged from the Stalin-era Comintern to indicate a never-fulfilled democratic, reforming vision of transformation. Hobsbawm looked to the PCI as bearer of an alternative vision of social progress, a broad alliance strategy able to surpass the whole Cold War divide. Its so-called “Italian road to socialism,” born of the antifascist period, stood in tension with not only “actually existing socialism” in the Eastern Bloc states, but also the Leninist model of 1917. For Hobsbawm, the Italian party was not simply “national” and idiosyncratic. It appeared to offer a course apart from either bureaucratic socialism or social democracy, relevant beyond Italian borders. In 1991 the PCI hit the end of the road: Hobsbawm had underestimated its real dependence on Cold War dynamics. Yet if he accused those who dissolved the party of “throwing the baby out and keeping the bathwater,” a closer look at his engagement with leaders like Giorgio Napolitano, and indeed his own reflection on Britain, shows how Hobsbawm shared many of the same assumptions that led the PCI to collapse. mainly because of the many British soldiers who came home after fighting the war in Italy, where they’d heard talk of him. I believe it was through some of them that I myself first heard of Gramsci, from men like the poet Hamish Henderson, a brilliant writer and great drinker, a Scot who was among the first to translate the Letters from Prison, and also from other people, who pushed me to look at his texts. One of these [and here he is referring to Louis Marks] was first to produce an anthology of Gramsci texts in England in the fifties, the Modern Prince, perhaps the first collection published outside Italy. Here Hobsbawm was a little modest — the 1957 anthology was published partly at his own instigation. And he already had a prior engagement with Italy, notably thanks to his close ties to the Communist economist Maurice Dobb and his colleague Piero Sraffa. Sraffa and Hobsbawm likely first met in Cambridge in 1950 during the unsuccessful campaign to make Indian prime minister Jawaharlal Nehru the chancellor of the university, thus succeeding the colonialist Jan Smuts. Sraffa had, perhaps apart from Gramsci’s sister-in-law Tatania Schucht, in the 1930s been the single figure most decisive to Gramsci’s contacts with the PCI’s exile organization. Hobsbawm’s account of returning soldiers talking about Gramsci seems a little romantic. During the war period the Sardinian Marxist was invoked far more as an antifascist martyr and origin myth for the PCI, than discussed in terms of his original thought. Indeed, his Prison Notebooks (whose existence was revealed in PCI daily l’Unità in April 1944) were not published until after the war. A first volume of the Letters from Prison was published in Italian in 1947, while an abridged, thematic edition of the Prison Notebooks appeared from 1948 to 1951. This operation would have been impossible without Sraffa’s mediation, but even in the 1950s the Italian economist modestly refrained from telling Hobsbawm of the role he had played. As Anna Di Qual describes in her brilliant PhD thesis on Hobsbawm’s Italian ties, the Florentine historian Delio Cantimori had a particular role in drawing Hobsbawm to Italy. His first visit to Rome was in late August 1951. Cantimori, who left the PCI in 1956, was a keen student of heretics and utopians of the eighteenth century, thus sharing obvious overlaps with Hobsbawm’s own histories of pre–labor movement social rebellion (the British historian’s 1953 visit to Sicily was also reflected in his Primitive Rebels). 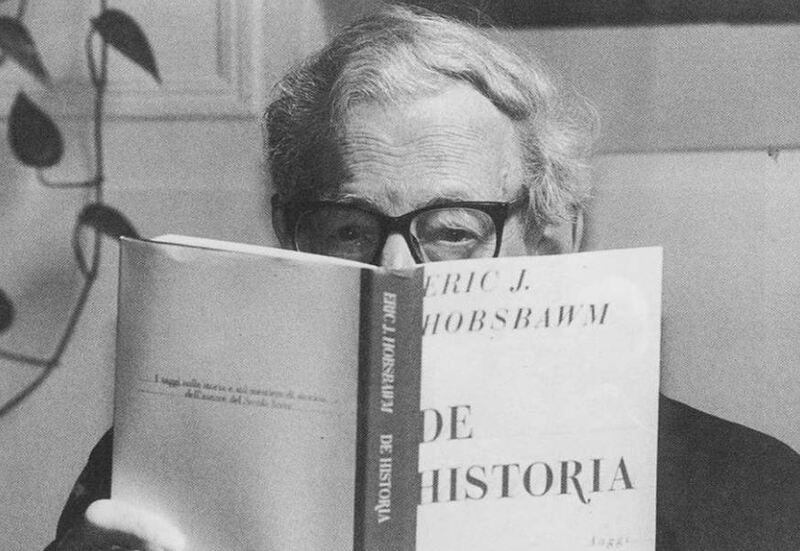 A first contact with Gramsci, in the year of the Prison Notebooks’ publication, allowed Hobsbawm to deepen his own understanding of writing the history of the subaltern, indeed in connection with national history: not just victims, but agents. As Hobsbawm wrote in his 1974 article “The Great Gramsci,” the contradiction here was that Gramsci was revived as a “heterodox” thinker, apart from the Stalinist tradition, whose imprisonment in the 1930s had kept his work above the fray of the decisions taken by the interwar Comintern; yet at the same time, he could be recovered precisely thanks to the fact that PCI secretary Palmiro Togliatti had always remained loyal to Stalin, and was thus well-placed to integrate Gramsci into a superficially orthodox Marxist Leninist canon without provoking controversy. The Rezeptiongeschichte [history of his reception] begins with the twentieth Congress of the [Communist Party of the Soviet Union in 1956]. For two decades it was part of the attempt by the international communist movement to emancipate itself from the heritage both of Stalin and the Communist International. Hobsbawm saw the Soviet invasion of Hungary in 1956 as a “tragic necessity” but criticized foreign Communist parties for simplistically championing Moscow’s line. In fact, he took a keen interest in so-called “polycentrism” and revolutionary experiences outside of Moscow’s direct control, notably visiting Cuba in 1960. His search for a path out of Cold War dividing lines however essentially relied on a new edition of the wartime antifascist alliance, uniting Communists with liberal and Christian Democratic forces. This stood counter to the radical left that emerged during the ’68 period, which more often damned the Communist parties precisely because of their failure more aggressively to confront Western capitalism. For an example of this we need only consider his close friendship with Renato Zangheri, a PCI mayor of Bologna who implemented a reforming agenda in local government yet also sharply clashed with the social movements of the ’77 period. Hobsbawn’s own party was small: only briefly during World War II did the CPGB top fifty thousand members. Conversely, the PCI was a mass party in a political system based on Cold War dividing lines, even more than the French Communist Party (PCF). After the end of the wartime antifascist alliance, in 1947 Italy’s Christian Democrats pushed the Communists and Socialists out of government, and remained in government, alone or in coalition, uninterrupted until 1994. The PCI’s efforts to break out of this impasse also represented a global search for a path beyond Cold War divides and, decisively, a reassertion of the antifascist alliance. This was particularly relevant in 1973, with the violent overthrow of the socialist experiment in Chile, a country in both Hobsbawm and the PCI’s attentions. As PCI general secretary from 1972 to 1984, from the start of his leadership Enrico Berlinguer emphasized the need for a rapprochement with Catholic Italy. In this he built on Palmiro Togliatti’s own sharp rejection of the PCI’s earlier anti-clericalism and embrace of social conservatism. But after 1973 Berlinguer emphasized the importance of going beyond a simple alliance of the Left able to secure a parliamentary majority as had Chile’s Salvador Allende. For Berlinguer, this meant introducing the PCI into national government and showing its “responsibility” as an institutional force even in a NATO country. Throughout the 1950s and 1960s the PCI piled on votes in each general election, from 1970 also building bases in regional government. The June 1976 election marked a particularly striking advance as Berlinguer’s party took 34.4 percent of the vote for the lower house, against 38.7 percent for the Christian Democrats. This portended the realistic prospect of the PCI eventually becoming the biggest party. The Italian Communist leader Berlinguer has quite rightly pointed out that [broad alliances extending beyond the Left are necessary] in countries such as ours, whether there are people’s fronts or not. Even if the Italian CP were to get 51 percent of the votes — or even a lot more — and establish a pure CP government, it would still have to carry most of the other 49 percent with it. The Italian analysis of the tragic Chilean experience is that Allende failed not simply because his Popular Unity was unable technically to defeat the military, but because it alienated large sectors of the population which it ought to have carried with it, or at least not allowed or stimulated to become bitterly antagonistic. This was married to a general disposition to revise the idea of a final and total end to capitalism, associated with the Eurocommunist trend now emerging in Western Europe’s Communist parties. If a PCI man like Giorgio Amendola denied his party sought to create a new international leadership to replace the old one in Moscow, CPGB man Eric Hobsbawm did look to the PCI to inspire parties abroad. This was notable in his dialogues with Giorgio Napolitano, a representative of the PCI’s internal right wing — the so-called miglioristi. If in the first 1975 dialogue between the two men the (pejorative) word “Eurocommunism” went unmentioned, in the second — taking place after the March 1977 meeting in Madrid between Berlinguer, the French Communist leader George Marchais, and the Spanish Communist leader Santiago Carrillo — the PCI attempted to appropriate the term. For Hobsbawm, the PCI was more than simply of interest because of its particular Italian idiosyncrasies. In its quest to revive the antifascist alliance of 1943 to 1947, and indeed its bid to transcend the binary logic of the Cold War, the PCI represented a genuinely international alternative to the Soviet model. In the past Communists frequently committed the error of maintaining that there is no way out besides socialism, that capitalism cannot overcome its crises. It was able to do so in the past, and it may be able to do so yet; the problem is one of choosing between differing solutions and not immediately one of the alternatives between socialism and catastrophe. This emphasis on broad alliances and intermediate solutions also informed Hobsbawm’s writing on Britain itself. Significant in this regard — highlighted by Di Qual — was the conference held at the Polytechnic of Central London in March 1977, with the financial aid of CPGB-attached publisher Lawrence and Wishart, on the fortieth anniversary of Gramsci’s death. Organized on the initiative of Donald Sassoon and Lucio Sponda, both students of Hobsbawm’s, it also included the participation of Italian Gramscians Bruno Trentin, Giuseppe Vacca, and Nicola Badaloni. The conference provided the intellectual hinterland for a much more famous later intervention of Hobsbawm’s, the 1978 Marx Memorial Lecture “The Forward March of Labour Halted?”. Already at the 1977 conference, Hobsbawm had strongly asserted a political reading of Gramsci and, moreover, the centrality of politics, “the core not only of the strategy of winning socialism, but of socialism itself.” This set the stage for the essential argument of “Forward March,” which cast doubt on the continued strategic power of the trade union movement and highlighted the centrality of the political moment, and other terrains of the struggle for hegemony. The fall of Soviet socialism did not validate the PCI’s ‘Italian road to socialism’ but merely exploded its internal contradictions. This reading, which Hobsbawm would elaborate throughout the 1980s, was perhaps slower to come to fruition in Britain than in Italy. The defeat of the Fiat strike in Turin in 1980 was not as searing and general a setback for the trade unions as was the 1984-85 miners’ strike in Britain. Nonetheless, the high electoral score for the PCI in the 1984 European election — a third of the vote, and the only time it came in first place — did little to mask its loss of strategic direction. In fact, after the failure of the historic compromise (derailed by the Red Brigades’ murder of Christian Democrat Aldo Moro in 1978, emboldening the anticommunist line among democristiano hardliners), the PCI faced setbacks in the 1979 and 1983 elections, indeed the first time since World War II its forward march was halted. The rise of the white-collar workforce, surging precisely after the dying-down of the movements of 1977, helped form the electoral base for Bettino Craxi’s Italian Socialist Party, which finally came out of the shadows of its Communist brother. In 1983 Craxi was appointed prime minister, in a coalition reliant on the larger Christian Democratic bloc. Italy’s impressive growth in the 1950s and 1960s, surpassing even the British economy, had seemed to build a mass industrial working class — yet it existed for only one generation. And so, too was there a generational shift in the PCI itself: Berlinguer’s death meant that for the first time the party passed out of the hands of the generation of leaders trained in the Resistance of 1943–45. All this severely undermined the PCI’s strategy and identity, and therefore its ability to serve as a beacon for foreign Communists like Hobsbawm. Indeed, if Berlinguer had declared in December 1981, after the Jaruselski coup in Poland, that the progressive thrust of 1917 was now exhausted, the PCI would increasingly look abroad — to the German Social Democrats and the British Labour Party, or even back to reformers in the Soviet Union such as Yuri Andropov and Mikhail Gorbachev, to incarnate a new, European vision of socialism, overcoming the Cold War division of Europe but also the Italian national framework. None of this came to pass. In his 1994 Short Twentieth Century Hobsbawm would describe Soviet leader Gorbachev as a “tragic figure . . . who destroyed what he wanted to reform and was in turn destroyed”; he would later criticize the PCI’s dissolution with the memorable metaphor of the baby being thrown out while the bathwater was kept. Yet at the same time, as the PCI’s strategic position was weakened in the 1980s, Hobsbawm himself tended to follow in the wake of its own drift toward social democratic or even liberal reference points, trailing behind an amorphous social Europeanism. This was notable in a June 1989 interview for PCI daily l’Unità in which he advocated “the development of a new left in Europe,” necessary “because of the need to build action at the continental level. Up until now political movements of the Left have for the most thought in local, national terms” — a level that now had to be transcended. Indeed, it was Hobsbawm’s own allies in the most reformist wing of the PCI — not least Giorgio Napolitano, from 2006-2015 Italian president as a member of the Democratic Party — who spearheaded the rush toward “Europe” as a solution to Italian ills, and as a political identity able to replace the discarded Communist one. our movements have also changed their tradition; it is necessary to let go, to be flexible, as reason demands. But it is very important for the Left to remember that we aren’t people without a past, that we are the oldest movements existing in Europe to improve the situation of ordinary people, of the people. And there is pride and strength in this. History is not something to neglect, even our own. But that does not mean mythologizing it. The fall of Soviet socialism did not validate the PCI’s “Italian road” but merely exploded its internal contradictions. Over the 1990s and 2000s its leaders built toward today’s Democratic Party, an ex-Communist and liberal force rather than a social democratic one. The baby was thrown out and the bathwater maintained: an opportunist gradualism and elitist identification with institutional power remained, while the promise of social change was abandoned; the reference to Gramsci was both toned down and made a pure incantation. Meanwhile Rifondazione, an attempt to refound the new PCI, remained trapped in that party’s historic dynamics and indeed its ties to the forces that created the Democrats. In later years Hobsbawm would have high praise for Lucio Magri’s Tailor of Ulm, a rare critical reflection on the PCI’s record. But it is hard to ignore the fact that while Magri’s dissident comrades from the Manifesto group — for instance Rossana Rossanda and Luciana Castellina — produced valuable reflection on PCI history, the figures who stood closest to Hobsbawm took a far more cavalier view, as if merely distancing themselves from an embarrassing past. If the PCI’s rhetoric of national unity had long had a conservative thrust, in the post-2008 crisis period, now-president Napolitano used it to demand collective belt-tightening. Hobsbawm can himself hardly be blamed for the PCI’s many failings, or still less those that aggravated after its demise. A Marxist in a country whose own Communist Party was at most able to exert influence on Labour, he looked to the PCI as bearer of an alternative vision of social progress, a broad alliance strategy able not just to change Italian politics, but to surpass the whole Cold War divide. Such a hope met its demise together with the Eastern Bloc; at the time of the historian’s death in 2012, the political left was in the doldrums in Britain as elsewhere. But three decades after the fall of the Berlin Wall, with liberalism everywhere in crisis, perhaps history itself will live to fight another day.